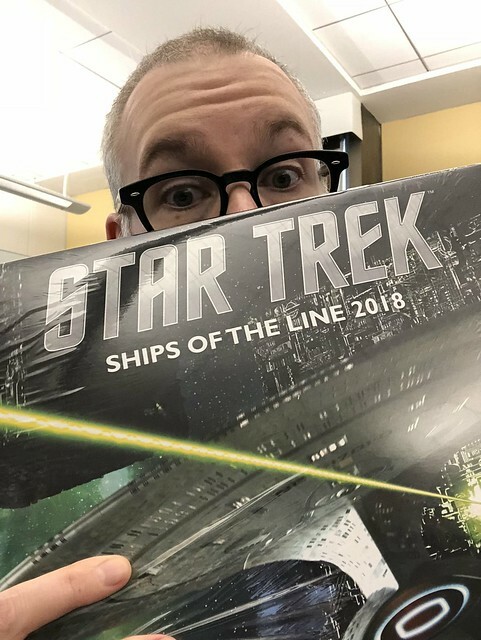 One thing that Marisa knows will also be a Christmas present hit with me is the Star Trek: Ships of the Line calendar. Every year, up until this year, Marisa has purchased this calendar for me and I loved it! Last year was no exception! I unwrapped the calendar, knowing was it was, and tucked it next to the couch so I could bring it to work with me when my "Special Winter vacation" was over. And that's where it sat until yesterday when I noticed it sitting there unloved, unused, and neglected. I pulled out it and showed it to Marisa. She said, "yeah, that's why you're not getting that calendar this year." I couldn't resist them (get it?). And they were cast from the original molds used for the props on TNG, DS9, and Voyager. Marisa was disappointed that they don't beep when you tap them. I had to break it to her gently: they add those sounds in post-production. If I had $1300 to waste (which I suppose I could spend on this, but I won't) and some reason for owning one I'd totally get this Wrath of Khan jacket. It is very slimming, as you can see in the picture above. The Internet is an amazing thing. Today’s evidence of this: Larp Trek. I found out about this amazing comic from Carrie Anne, who will be appearing on a future episode of Random Trek. When she told me about it she said, “You’re going to lose a lot of time to it.” She was right. Here’s the idea behind it: the holodecks are all offline on the Enterprise and the TNG bridge crew needs something to entertain them. Geordi decides to game master a role playing game where each of the crew members plays a character on the fictional space station “Deep Space Nine." That’s right, this comic imagines that DS9 was a campaign in an RPG played by TNG characters. I can’t even. Just read it. Read it now. Start at the first page. 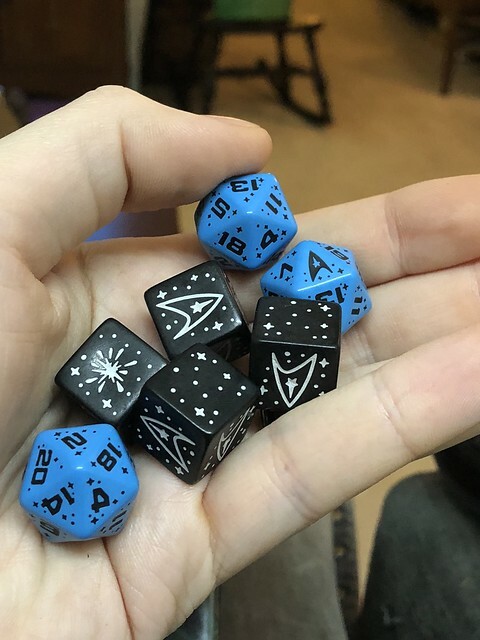 If you like D&D and Star Trek you won’t be sorry. I have an Ikea chair in the Den (which Marisa refers to as "my room" since it is the area of the apartment in which I have the most say over what goes where) and it usually has a pile of random stuff on it. 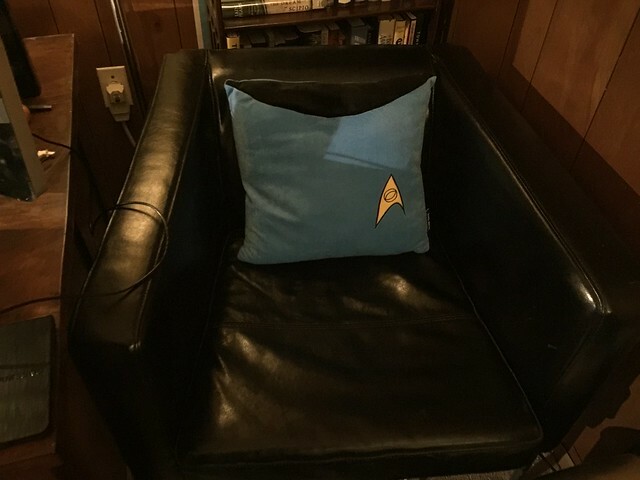 That is, until I found this Star Trek pillow on ThinkGeek. I went with the Science pillow because that's how I roll. 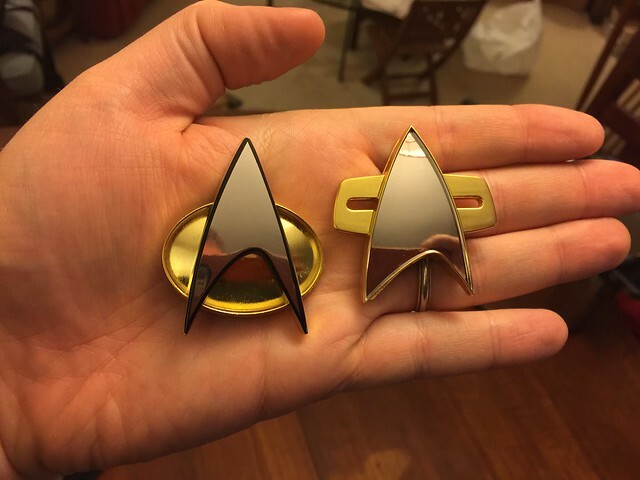 It is no secret that I'm a big Star Trek fan. I mean, I host a podcast devoted to Star Trek for goodness sake! It follows that one of my favorite (if not the favorite) movies is Star Trek II: The Wraith of Khan. I can watch this movie over and over again. One of the pivotal ships in the movie is the U.S.S. Reliant (which seems to have a B Team crew, as discussed in this episode of the Incomparable). Khan manages to takeover the ship rather easily and hijinks ensue. Of course such high levels of detail and high quality build construction translates to a $9,995 price tag. A little too rich for my blood (though honestly, I'd probably buy one if I were single. I don't think Marisa would agree that this is a good use of the money, and it isn't really). Though if you have $10,000 you don't need and an unusual amount of like for me you now know what to get me for my birthday. When you host your own podcast (Random Trek, you should listen!) a funny thing happens: people start inviting you onto their podcasts. I suppose it makes sense, really. When I think about inviting someone onto Random Trek I skew towards people I know will be able to hold up a conversation, so having podcasting experience is a good thing. Now, some might say, "But, Scott, you've been on the Incomparable forever! Shouldn't people have invited you onto their podcasts based on that?" No. Why not? Well, I don't talk a whole heck of a lot on most Incomparable episodes that I am on. So, as a host looking for potential guests I wouldn't consider me either based on those appearances. TDB - Jordan had me on his 12 step program themed tech/culture interview podcast and it was a lot of fun. I figured we'd talk about my Kindles, and we did, though we spoke more about my unhealthy need to acquire more books. Also Star Trek. Check out the episode (and give the older shows a listen too, Jordan is both funny and a good interviewer). The Committed: Based on my appearance on TDB I was invited onto the Committed podcast to talk about Kindles, the future of books, and Amazon's taco delivery service. Ian, Kirk, and Rob produce a fine show (despite having me on), so you should give it a listen. The Incomparable: Speaking of podcasts I'm on, the lasted episode of the Incomparable is dedicated to the best/worst of Star Trek and I'm a panelist. The other funny thing about having a podcast is that people ASK to be on it. This is something that has never even occurred to me, to be honest. I listen to a fair number of podcasts and I don't think I've ever emailed/contacted the host and suggested I be on (well, other than Your Daily Lex, but that suggestion was a joke which came true. I'm on episode 3!). I don't think there's anything wrong with it; it just isn't something I would do. Maybe I should be emailing people asking to be on their shows! I had this crazy idea: I should do a podcast in which I would be joined by a guest (a single guest) and discuss a random episode of Star Trek. I know what you're thinking, "That doesn't sound too crazy." Well, here's the thing, if I'm best known for anything in the world of podcasts it is my silence. I'm not a naturally chatty person and since most of my podcasting appearances involve panel discussions I can sometimes fade into the background. The idea that I should host a podcast and be joined by only one other person seemed daunting to me (I thought the random Star Trek part was a pretty good idea right from the start). I did what I do whenever I have a crazy idea: I told Marisa about. Since she has had at least three non-consecutive successful conversations with me about a variety of subjects she didn't think the idea was crazy. In fact, she encouraged me to do something about it. That's the other thing about my crazy ideas: they usually stay ideas. I don't think I'm alone in this tendency. Sadly, for me, I'm also a classic over-thinker. I think about stuff for a long time before doing anything (you can ask Marisa about this too!). Emboldened by Marisa's support of the idea I thought about it some more. I pondered who would be a good first guest for awhile and the answer became clear: Jason Snell. Jason, in addition to being a huge Star Trek fan, is a doer. I figured if he was into the idea the likelihood of it actually becoming a thing would be greatly increased. Jason did, in fact, like the idea and in turn motivated me to actually do something about it. I registered a domain, I got a Twitter account, and then I thought about it some more. Now, as I was pondering the podcast Jason launched The Incomparable family of podcasts (The Incomparable, Not Playing, Total Party Kill, and teevee). Random Trek had found a home. Now you can listen to the first episode (you totally should) and I'm very excited about the whole thing. 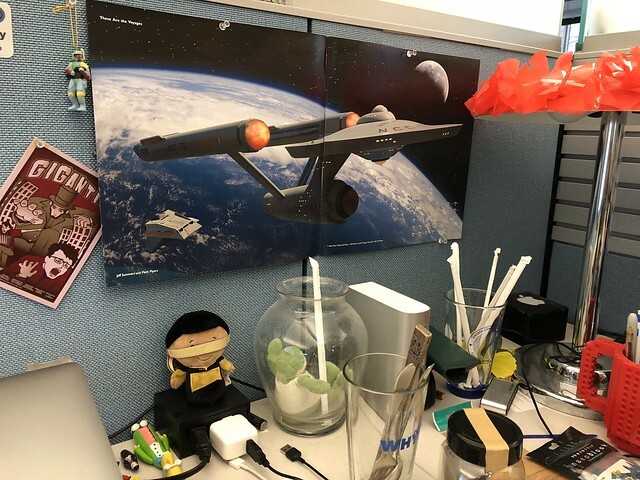 Look for new episodes of Random Trek every Thursday for the next 680 weeks or so (assuming there isn't a new Star Trek series released over the coming 13 years). The last couple of weeks have been heavy on the D&D for me. First, the long time in the planning the Incomparable D&D session happened over the weekend. The podcast isn't up, but you can watch it on YouTube if you're into that sort of thing (and who isn't). 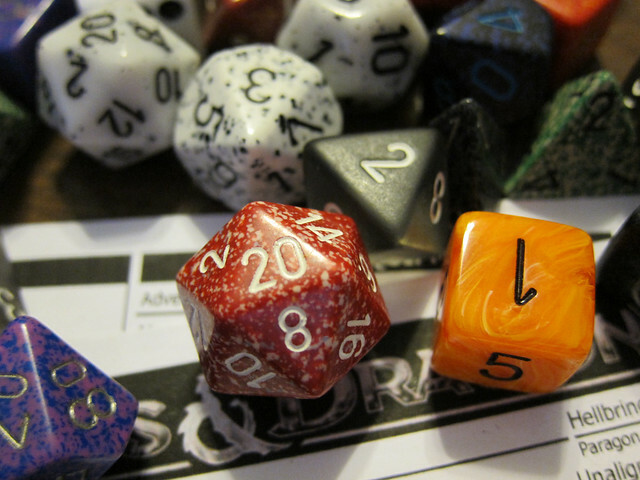 I also penned a piece for The Magazine about how D&D has shaped me as a person. The isn't my normal kind of writing, but I'm pleased with how it came out (thanks to Marisa for helping, and thanks for Glenn for accepting the pitch!). Let me know what you think of the piece. I'm very curious because this kind of writing is outside of my comfort zone. I'm also concerned that the last section makes me out to be something of a sociopath, but I'm really not! You can trust me, I totally have "human" "emotions." 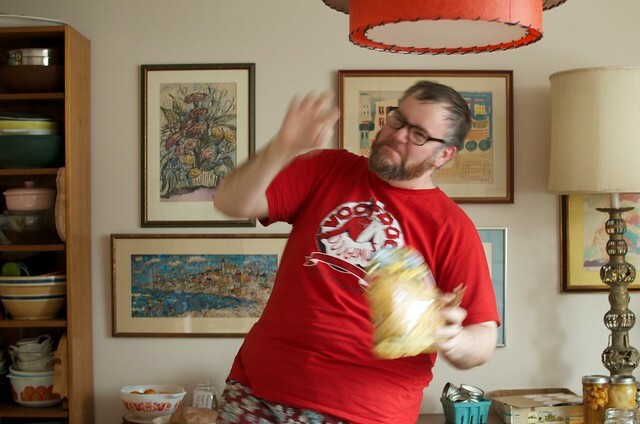 Photo by Marisa (t-shirt, and body, by VooDoo Doughnut. Whenever I launch an app on my Mac for the first time I immediately launch the preferences and change the default font settings. As I've aged so have my eyes, so I need to increase the size (the super high resolution monitors haven't helped my eyes, sure the picture looks great but everything is even smaller!). And I generally change the font face to Calibri which might be among the great things Microsoft has ever created. I don't know why I love this font, but I do. Good job, Microsoft typography team! Anyone who knows me knows I enjoy a Hawaiian shirt or 32. I like wearing them all the time, but I have nothing on John Lasseter. He has over a 1,000 of the things (plus he has way more money than I do, but that's just a tiny detail!). Check out this interview in which part of John's collection is featured. Put me in coach, I have a clear mind and heart... and a nice shirt. Since I had to leave the apartment today (silly job!) I slipped on a shirt that makes me think of one of my favorite shows: Dexter. If I were a People magazine writer this is where I would say, "Who wore it best?!" Since I am not, in fact, a People magazine writer I am certain that I look best in the shirt (though Batista knows how to rock a hat! ).